The Puccini E La Sua Lucca calls itself the "only permanent festival in the world," running a concert every night of the year. We attended one tonight and greatly enjoyed it. 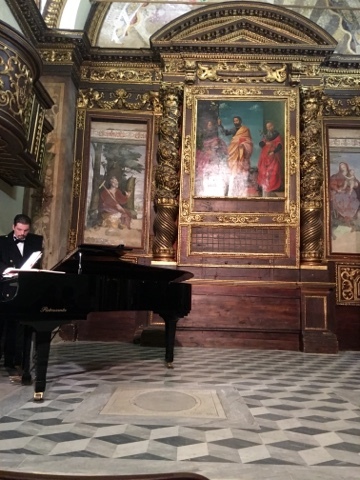 Although they describe it as a concert, we would call it a recital, featuring a young soprano, Francesca Maionchi, a baritone, Michele Oierleoni, and a pianist, Diego Fiorini. The venue was a small room with about 60 chairs, only half of which were occupied. We sat in the second row and were absolutely enveloped by the singers' voices. It's a short performance, which was fine with us. At €18 each for discounted tickets, it was a bargain, given the quality of the performance. We may even go to another one tomorrow night.